How does one restore balance? There are many approaches to this problem. Identifying what needs to be restored is a good starting point. Recall the four Rs of balance mentioned last month. See the diagram below and refer to the March blog post for more information on the four Rs. Let’s use rest as an example. Are you sleeping less than seven hours or more than eight hours per day? If you are there is probably an imbalance in yourself that needs to be adjusted. Recall that poor sleep quality or inadequate amounts of sleep can affect all areas of your health so it is vital to have this parameter of rest in balance. How do you get the proper rest? What is causing an improper amount of time spent in sleep or poor quality of sleep? Simply lying in bed for seven hours will not restore balance. The amount of time in sleep as well as the quality of sleep are the parameters for rest balance. 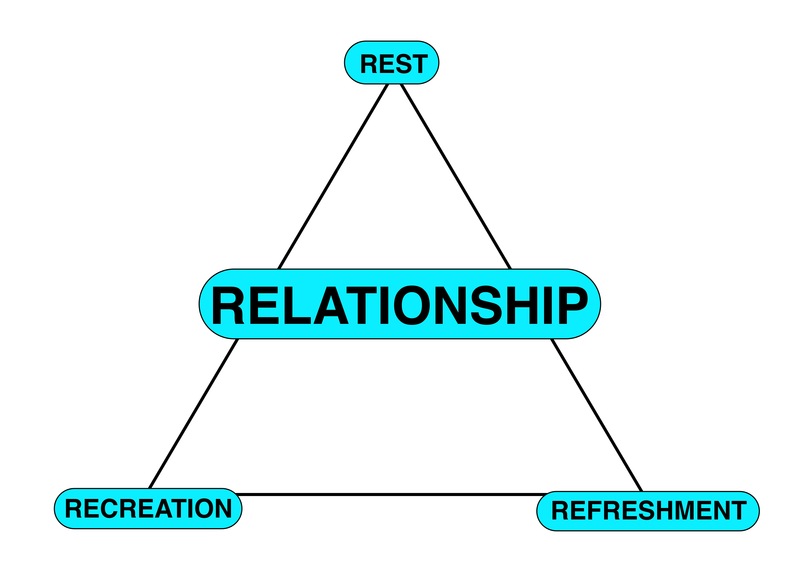 Once factors that are impeding good sleep are uncovered, the work of restoring sound sleep begins because without this vital apart of the balance triangle, the remainder of the self cannot come into balance. One method of discerning the factors that are interfering with appropriate rest are to categorize them as intrinsic or extrinsic factors. Intrinsic factors are those from within such as health problems (sleep apnea, for example) that are interfering with quality sleep. Extrinsic factors (such as medication side effects) are factors outside of the body that are contributing to the problem. Usually extrinsic factors are easier to resolve but not always. When sorting through all the potential causes of poor sleep you may need assistance from others. For example, do you sleep poorly due to restless leg syndrome? A partner can help identify this potential problem and you can then address it with your healthcare provider. Additionally, speaking to your healthcare provider about health, medications, and possible other factors is also a good idea. You might need to speak to your employer about your work schedule if this is a factor. Shift work is known to be a contributor to poor sleep quality. A good reference on this can be found at http://www.sleepfoundation.org/article/sleep-topics/shift-work-and-sleep. Sometimes it helps to have an impartial person such as a coach to assist with getting back on the road to balance. That is where I can help. As a family physician, I have invaluable insights into many factors that can present as problems and I can also provide resources such as medical articles for your information. Being impartial, I can make assessments that might not otherwise be obvious. As a coach, I am there to assist and empower you to take control of your life balance. Feel free to contact me for more information about this blog post or any other questions that you might have. The blog topic for May will be about STRESS – Senseless Thoughts Repeated Endlessly Surrounding Self. You are currently browsing the Pearls of Wisdom Consulting Services blog archives for April, 2012.